Today is Video Game Day . . . Like that needed promoting. That said, I’ve played a few video games in my time . 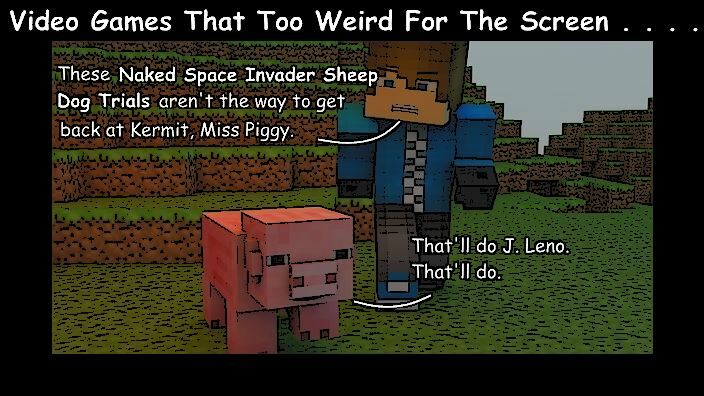 . . and some of them are pretty weird creations. I mean, even Mario Brothers ( if you logically examine the elements ) makes no sense. If it does make sense to you . . . cut down how much you’re smoking. But there are games so bizarre that no form of abuse can justify or explain their existence. Seaman ( That’s right … Not a typo. ) by Dreamcast comes prominently to mind. This is a virtual pet game, ( Not to odd so far. ). Featuring a fish ( Okay. Bit dull. ). A fish with the face of a New York slum landlord. How do you get that to breed? Other notable mentions include Goat Simulator ( I kid you not ha ha 😀 ) and Leisure Suit Larry, a game which seemed to expect gamers were so lonely that they would be aroused by blocky graphics and twiddle more than just their thumbs. 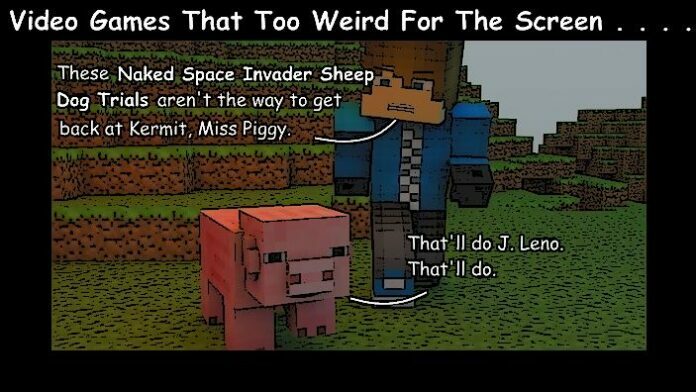 So, if you think that Naked Space Invader Sheep Dog Trials featuring J. Leno and Miss Piggy cannot happen . . . then, think again.